Matt Heron (white) scored for Whittlesey Athletic at Moulton Harrox. Whittlesey Athletic can take a giant step towards their dream of United Counties League football by beating rivals Netherton United in a Peterborough Premier Division match at Feldale Field tomorrow (May 3, 6.30pm). Whittlesey have to finish in the top five to be elegible for promotion and that is already assured. Now they need to make sure they finish above Netherton, the only other top-flight team to apply for promotion. Herbie Panting (red) scofred twice for Netherton United against Langtoft United. Whittlesey overcame the toughest possible hurdle by winning 3-0 at champions Moulton Harrox on Saturday (April 30). They are currently four points ahead of Netherton and both teams have four matches to play. Liam Harrold, Matt Heron and Adam Piergianni scorde for Whittlesey at Moulton, while Netherton were keeping in touch with a 4-0 win at home to fading PFA Senior Cup finalists Langtoft United. Herbie Panting scored two delightful set-piece goals for the city side with ace veteran Ronnie Fortune and Eric Makate also on target. After Netherton, Whittlesey have to play Leverington, Peterborough Sports Reserves and Uppingham. Netherton also have matches outstanding against Uppingham and Sports - Sawtry are their other remaining opponents. Pinchbeck are currently ahead of both promotion-chasing teams in second, a position they retained with a comfortable 5-1 win at Uppingham. Tony Edwards scored twice. Pinchbeck host Holbeach United Reserves tomorrow. Dan Fountain scored twice as Sports Reserves stayed fifth with a 2-1 win at Ketton. The city side have been hit hard by point deductions for admin errors. They’ve had a total of eight points removed. Leverington won a stormy bottom-of-the-table clash with Riverside 5-1 with Mariusz Kudyba on target twice. Riverside finished with nine men as referee James Truman dimissed Matt Smith and Paul Smith. Two goals from Jack Travers secured the Division One title for Stamford Lions as they won 2-0 at Whittlesey Athletic Reserves, while Brotherhoods clinched the Division Four crown with a 6-1 win over Huntingdon Rovers. All Peterborough League champions have now been determined. Oakham United Reserves and Stanground Sports won the Division Two and Three titles respectively the previous weekend. 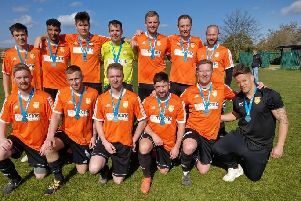 It was a busy weekend of cup finals with Division Three side Tydd St Mary beating Division Two outfit Whittlesey Athletic A in the Intermediate Shield Final. Will Kirkham, Dale Parnell and Jason Powely scored the goals, all of which arrived in the second-half, two of them in added time at the end of the game. There was an all Division Two clash in the final of the Peterborough Sunday Morning League’s Hereward Cup with Premiair pipping Cardea 2-1 thanks to outstanding early goals from Giuliano Staffieri and man-of-the-match Josh Smith. Daryn Whiteman replied for Cardea with a towering header in the final moments. And the Sunday League’s McCain Cup Final was won by 10-man Brewery Tap, 2-1 over Division Three rivals ICA Sports Colombo. Tap could only field 10 men from the start as many of their regular players were ineglible for the cup, but a goal from Tom Smith and an 89th-minute overhead kick from Craig Rook sealed victory. Kieran Deboo replied for ICA. Deeping Rangers Res v Langtoft United, Ketton v Uppingham Town, Pinchbeck United v Holbeach United Res, Sawtry v Leverington Sports, Whittlesey Athletic v Netherton United. Division One: Sutton Bridge United v Long Sutton Athletic. Division Two: Spalding Town v Pinchbeck United Res. Division Four: Holbeach Bank v Long Sutton Athletic Res, Parkway Eagles Res v Parkside. Division Two: Sawtry Res v Thorney Res, Whittlesey Athletic ‘A’ v Hampton. Division Three: Farcet United v Stamford Lions Res, Tydd St Mary v Stilton United Res. Division Four: AFC Stanground Res v Rutland DR, Warboys Town Res v Brotherhood Sports.